The family of Nicholas Gibbs say police used "excessive and disproportionate force" against him, poorly assessed the situation, acted unreasonably and did not follow the law regarding the independent investigation of police shootings on the night the 23-year-old died. The family of Nicholas Gibbs, a 23-year-old man fatally shot by police in Montreal's Notre-Dame-de-Grâce neighbourhood this summer, plans to sue the city for just over $1 million. In court documents, they say police used "excessive and disproportionate force" against the man, who had mental health issues. They say police poorly assessed the situation, acted unreasonably and did not follow the law regarding independent investigations on Aug. 21, the night Gibbs died. The family also released cellphone video, just over a minute long, taken from a nearby apartment, that shows the police intervention in progress, culminating in the moment Gibbs was shot. In their suit, Gibbs's mother Erma, two sisters, Tricia and Tamesha, and girlfriend Tanika are seeking a total of $1,035,000 in moral damages and $100,000 in punitive damages, plus interest and legal costs. "It hurts. I have to live the rest of my life, not knowing — I won't be able to see my son again," said Erma Gibbs, her voice wavering, during a news conference Tuesday morning. "It's not going to be easy for me, to live in this city, to know this. I don't want another black family to go through this." The family is launching a crowdfunding campaign to raise funds for the legal proceedings. Quebec's police watchdog, the Bureau of Independent Investigations (BEI), is investigating the shooting — as is the case whenever someone is hurt during a police intervention and whenever a police weapon is discharged. The BEI issued a news release with preliminary information the night the shooting occurred. It said police were called to the scene to break up a fight at the corner of corner of Montclair Avenue and de Maisonneuve Boulevard. During that intervention, one of the two men approached an officer with a knife. Police officers used a stun gun on the man, "without success." It is unclear what was meant by that. Police then fatally shot the man. He was taken to hospital, where he was pronounced dead. That man was later identified as Gibbs. The video was obtained by the family's lawyer from a witness and appears to have been filmed from an apartment balcony. When the video begins, the police operation is already underway. Gibbs can be seen walking east on de Maisonneuve, and a voice, presumably a police officer's, is heard stating the man has a knife in his hand. The knife is not visible in the video. Gibbs keeps walking, goes up to a police cruiser, reaches in and honks the horn. There don't appear to be any officers inside the cruiser. One officer appears to try to pepper-spray Gibbs, but Gibbs then turns and walks in the other direction. Throughout the intervention, voices can be heard yelling at Gibbs, in French, to stop moving. (The court document from the family's lawsuit states that Gibbs does not speak French.) Gibbs keeps going. Another car, unrelated to the incident, rolls into the scene. Police yell at the driver to move along, which that vehicle eventually does. Gibbs is still on the move. He starts walking toward the officers. A voice yells, "Stop," in English, four times. On the fifth "Sto–​," the gunshots start. Four ring out, and Gibbs turns and walks away. With his back turned to the officers, a fifth shot is fired. Gibbs crumples to the ground. A voice yells, "Don't move. Throw your knife away. Put your knife down." Moans can be heard in the background. The video does not show officers using a stun gun on Gibbs. The family's court filing says from watching the video, it's impossible to know whether Gibbs was carrying a knife. It states that the officers didn't try to de-escalate the situation with Gibbs, and that the moment he turned his back, police officers should have re-evaluated the situation instead of shooting again. The following video contains graphic images and audio from a police intervention in which a person was fatally shot. Please exercise discretion. The court documents also include a letter, dated Sept. 4, addressed to Martin Prud'homme, acting chief of the Montreal police (SPVM), from Madeleine Giauque, the head of the BEI. According to Giauque's letter, SPVM officers met Gibbs's family members and witnesses at the scene before speaking to the BEI. Moreover, those statements were reviewed by SPVM investigators before the witnesses were released. Both those actions are against the law governing the BEI and undermines its work, Giauque told Prud'homme. That law states officers must withdraw themselves from the scene immediately after an incident and, independently of each other, write up their version of the events that led to the incident under investigation. Those reports are then sent to the BEI. Giauque told Prud'homme that BEI investigators informed her the way SPVM investigators handled the early stages of the investigation into Gibbs's death is standard practice. "Indeed, when they told me of this situation, I learned that the same problem has arisen in several, if not all, SPVM investigations," Giauque said, going on to describe incidents in March 2017 and December 2016 in which witnesses were taken to the local police station to be questioned before BEI arrived on the scene. Giauque said a letter had been sent to Prud'homme's predecessor raising concern about that practice. "This way of doing things undermines the credibility of a BEI investigation," Giauque goes on to say. She said the SPVM is the only police service in Quebec to act in such a manner. 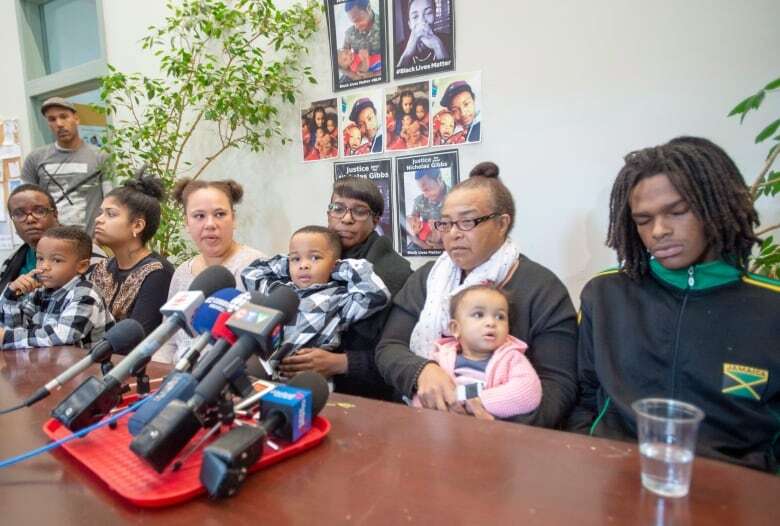 Community activist Will Prosper, who attended Tuesday's news conference with the Gibbs family, accused Montreal police of showing complete disregard for the BEI. "They know what the procedures are and they're not respecting them," Prosper said, a former RCMP officer. In a statement later Tuesday, BEI spokesperson Martin Bonin-Charron said the BEI does not comment on ongoing investigations, adding the director is duty bound to inform the head of a police service when its officers do not comply with the law. SPVM spokesperson Insp. André Durocher confirmed that the police service had received Giauque's letter and said the SPVM has since changed its practice.